Ny video fra det kommende liveslippet. Info i eldre artikkel under. Det nærmer seg utgivelse av denne, coveret, trackliste og formater er på plass. 23. november kommer Wackenjobben i hyllene. Det står ikke noe om formater, men det er Nuclear Blast som slipper, og da betyr det at det trolig er snakk om de fleste alternativene. Vi leser at bandet ikke har ligget på latsiden i det siste, mellom plasteslipp og konserter, og den kommende festivalsesongen: "Over the past few months, the German band has been anything but passive, instead they‘ve been finalising their latest project, their upcoming live release Symphonic Terror – Live at Wacken 2017." Denne konserten ble jo streamet via Wackens hjemmesider, og mange har kanskje sett den allerede. Selv synes jeg nok kanskje ikke Accept var bandet som kledde stryk og orkester best, men det var sdamtidig gøy å se hvordan de løste det. "Fans can expect a unique, 2 hour Accept show, shot on August 3rd, 2017 at the legendary W:O:A, where the band played the biggest and most extraordinary show of their career in front of 80.000 live fans at the festival, on top of thousands more fans watching via the live stream! The show was divided into three parts, showing the full creative power of Accept: The first part hosted the premiere of new tracks Die By The Sword and Koolaid, as well as some of their most popular songs, such as Restless And Wild and Pandemic." Som midtparti i konserten stilte gitarist Wolf opp med litt av det han leverte på sitt siste soloalbum, en skive jeg likt veldig godt. 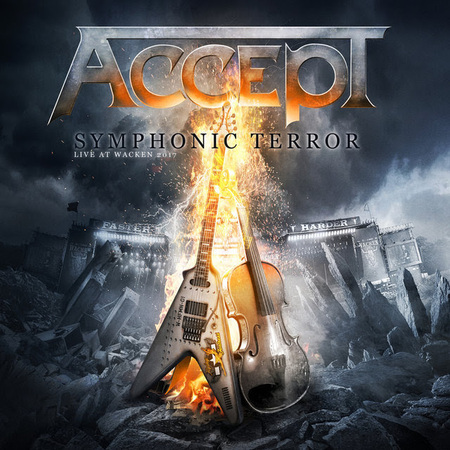 "The middle part hosted guitarist Wolf Hoffmann accompanied by a symphony orchestra, presenting the best-of from his recent solo album Headbangers Symphony, which includes metal versions of some of the world‘s biggest classical compositions (e.g. from Beethoven, Mozart, Vivaldi,...). And in the last but not least part, fans were able to bang their heads to Accept anthems (also accompanied by the orchestra), such as Princess Of The Dawn, Breaker, Fast As A Shark and Metal Heart, as well as to new songs like Stalingrad, Shadow Soldiers or Teutonic Terror. The finale could be nothing less than an 8 minute version of their eminent hit Balls To The Walls!"